P&RShow 13 Talking with "Fear"
We sit down and talk with Fear from FYFCast and Fearcast on this episode. From topics like The Walking Dead, some hidden knowledge stuff, and how he got into podcasting. Its a great conversation and we share lots of laughs, Thurbert even makes an appearance! We are back with this week with Maximus Groves of Comcastro. We talk podcasting, how he got into the podcast scene. Talk movies, TV shows and many other topics! Great conversation with Max, ENJOY! Pick and Ro are back with the new episode, talking the NCAA title game and the NFL Playoffs. They weigh in on this weekends results, and share Super Bowl picks! Also, they talk about winning the powerball! With all the phenomenon around it and share what they would do with the winnings, makes for a great episode! We sat down and talked about The Force Awakens and what we thought of the movie. There will be Spoiler Alerts, so if you haven't watched don't listen to this episode until you have. Alex Camacho returns and we talk about the MVP candidates for the NBA season, and it definitely gets a little heated. Just three friends getting into a friendly debate. Thanks to Resz for the music for this weeks Song of the Week. We sit down and talk Sports with the one and only Alex Camacho. A very in depth conversation of the BEST starting 5 of al time, talking Kobe Bryant and his last run. Also, talk about Stephen A and Skip, is Draymond Green really that great a player? Alex weighs in and offers his thoughts on this great episode. P&RShow 12 With Roel Santos Sr. In this episode Pick & Ro sit down and talk with Ro's father Roel Santos Sr. They talk everything from the Paris attacks, sports in general, and what growing up in his hometown was like back in the 1960s. They also get into some Jive talk? Its both entertaining and interesting has they have a great conversation! This episode Pick and Ro debate the whole MJ vs LBJ topic, who really is the better player? Also, they break down their all time starting 5 teams. Special guest Domenix Santos joins the discussion and provides his thoughts and insight on the topics. This is our 10th episode! Thanks for all the continued support! Rate, review and subscribe and share with everyone, your support helps us continue to grow! Follow us on Twitter @PickNRoShow, Instagram @thepickandroshow.Thanks for listening and following. This episode Pick and Ro discuss the last two episodes of the Walking Dead and offer their insights what has happened to Glenn. Also, they talk about the Morgan episode and what they thought it brought to his character. 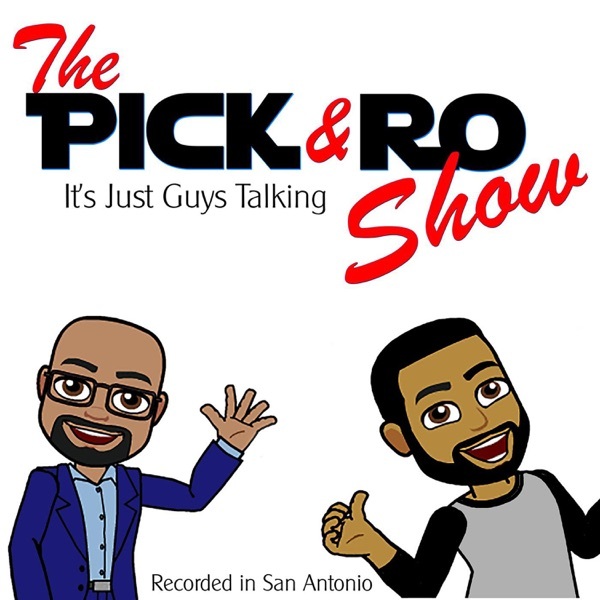 Pick and Ro then discuss the NBA season and give their picks on who will win the NBA Championship! Rate, Review and Subscribe on iTunes! Follow us on twitter @PickNRoShow. In this episode Pick and Ro talk about Pro Life, sparked by the controversial shirt worn by Kelsey Grammer. Columbus day, should this day be celebrated has a holiday? New season of Walking Dead has started, did the build up lead to a great first episode of the season? Finally, Pick and Ro hand out their Star Awards this week! This week Pick and Ro talk about Gun Control, and how its having an effect on the country. Should there be more control? Also, the first ever Star Awards are issued to people who do both good and bad. Farting in the workplace, is it really a bad thing to lose your job? They discuss this and much more! This weeks episode Pick and Ro talk about Sports and Entertainment throughout the show. There really isn't a set topic this week, just what it boils down to is two guys just talking. Finding the humor of how certain characters get portrayed and killed off in movies. Enjoy the show! Pick and Ro discuss current events in the world, mostly the upcoming presidential race. Kanye West for President? Also, the topic of what exactly does the government keep from all the U.S. Citizens, gaining ground on the hidden knowledge. Pick also talks about all the pyramids that are really in existence in the world! This week Pick and Ro discuss 9/11 and the impact it had on their lives that day and how it changed the world. Also, discuss the Kentucky clerk and her stance on not supporting gay marriage; as well as the SA high school football incident involving the referee. This weeks episode we sit down with fantasy football enthusiast Joey Flores and talk about how he takes on his league. Pick And Ro also give their review of Fear the Walking Dead, and Pick talks about what he thought of Straight Outta Compton. We also talk about the N word and if its offensive to EVERYONE. Pick And Ro offer their experiences and thoughts on how the entertainment industry had a cultural impact on society, and how it impacted their lives growing up. Its our inaugural episode of The Show! !